Thank you for being a part of our growing community. In order to keep the forums running well and to prevent problems, please follow these simple rules for the forums. If you have any questions or problems, please send an email to Forums. When participating in a Forum, never assume that people are who the say they are, know what they say they know, or are affiliated with whom they say they are affiliated. Information obtained in a Forum may not be reliable, and it is not a good idea to make decisions based solely or largely on information you cannot confirm. We cannot be responsible for the content or accuracy of any information, and shall not be responsible for any decisions made based on such information. All messages express the views of the author, and the owners of Queen of Stitching will not be held responsible for the content of any message. You understand and agree that the Service is provided "AS-IS" and that Queenofstitching.com assumes no responsibility for the timeliness, deletion, mis-delivery or failure to store any user communications or personalization settings. You must be a registered member of the Queen of Stitching Community to post on this forum. Visitors may read the forum postings. Please wait a reasonable amount of time before bumping posts. For general 'how-to' questions this should be at least 36 hours. For specific troubleshooting issues, use 24 hours as a guideline. We also do not allow posts or links to sites that are sexual in nature or violate Queen of Stitching community standards. The Queen of Stitching team shall be the sole arbitrator of what does and what does not violate community standards. Discussion of illegal activities such as software piracy and other intellectual property violations are not allowed. Each member is allowed one log in account. Registering with multiple accounts is not allowed. While we are quite happy to have constructive comparative conversations about competitor's products, we will not tolerate blatant advertising or the sort of 'ooh look, yet another competing topic' threads. Also, we would appreciate it if you refrain from blatant bashing of other products. Posts arguing about company policies are not allowed. Contact Customer Support if you have issue with company policies. All post must be made in English or contain an English translation. We also reserve the right to ban anyone who wilfully violates the forum rules, as access to our support forums are a privilege and not a right. A banned customer is still entitled to support from the support system and all other privileges offered at the Queen of Stitching website. We do not allow people to post threads or to send private messages or emails to users here that advertise or solicit any products, services, funds or donations. Explicit advertising and soliciting signatures is also prohibited. We do not allow selling at any of our Forums. Please use our Classified Ads for Selling, Trading and/or Buying quilting, embroidery and general sewing merchandise. You should never give out your Queen of Stitching user name or password to anyone. We can not take responsibility if you disclose this information to anyone else. Linking to a commercial product/service is fine, provided it is not a product or service that competes with a product or service offered by Queen of Stitching and it is not an affiliate program link for any affiliate program. Promotional text for a commercial product or service is ok, provided there are no price(s) of product(s) or service(s) listed and the products or services do not compete with any of the offerings supplied by Queen of Stitching. Use of the Queen of Stitching logo in avatars is not allowed by anyone that is not Queen of Stitching Staff or a designated forum moderator. We do not allow people to post that are looking to sell or buy a used Queen of Stitching designs either in the Forum or the Classified Ads section . Queen of Stitching designs are licensed to the original purchaser and may not be transferred. We do not allow people to post that are looking to sell or buy a used embroidery designs on these Forums. You must use our Classified Ads section to buy or sell. Classified Ad Rules are posted in the Classified Ad section of our website. The Come for Tea forum is where Queen of Stitching community members can gather to chat about almost anything, technical or non-technical in nature. If you have a question that doesn't fit into any other forum, or just want to chat, this is the place. Although the administrators and moderators of Queen of Stitching Community Forums will attempt to keep all objectionable messages off this forum, it is impossible for us to review all messages. All messages express the views of the author, and the owners of Queen of Stitching Community Forums will not be held responsible for the content of any message. By choosing to use the forums at Queenofstitching.com you are explicitly agreeing to these rules and you warrant that you will not post any messages that are obscene, vulgar, sexually-oriented, hateful, threatening, or otherwise in violation of any laws. The owners of Queen of Stitching Community Forums reserve the right to remove, edit, move or close any thread for any reason. Any disputes with the staff of the Queen of Stitching Community Forums will be handled privately and not tolerated within any of the forums. If you wish to escalate any issue with staff then please contact Customer Service. And hope you will visit again. The September update to the Pfaff Creative Vision has for the most part remedied this situation for this line. Minor tension adjustments are now all that is required. Something is wrong with my stitching. When I turn the hoop over and look at the stitches on the back side - they are loopy. What’s wrong? Sounds like you have one of the newer machines. We are using our embroidery units in ways that they have never been used before. Sadly, we are finding out that many of the major brands are allowing their machines to make their way into the world without having their embroidery stitch tension fully calibrated. For a permanent solution you may need to take your machine and embroidery unit into your dealer and have them calibrate the tension for you. Always make sure that you bring a sample with you so that the problem you are explaining is obvious. For a temporary solution - try increasing your tension while in the embroidery mode. It may take several tries before you have increased the tension enough to resolve the problem. You may also benefit from adjusting your bobbin case tension. If you are fearful of making this adjustment - get a second bobbin case that is only for embroidery or decorative sewing. Note: Pfaff Creative Vision owners - Our developers have found that it is necessary to make three adjustments to improve stitching results. First manually lower your pressure foot height on the Creative Vision both 5.0 and 5.5. Access the control by opening your Machine Settings - represented by a screwdriver and wrench on the bottom of your screen. Make sure that you have the Sewing Machine icon selected (bottom left hand side). Take the Embroidery pressure down to -2 or -3. Results will vary by machine. Second, increase embroidery tension to around 4.6. Third, ALWAYS, ALWAYS, manually lower your pressure foot when you begin sewing a color break or you may not have enough tension to lock in your stitches. We have been in contact with SVP - the group who now owns, Pfaff, Singer and Viking and will post news as soon as something is released. SPECIAL NOTE: Want your machine to sew like a dream during regular stitching? Try taking the regular pressure foot height (shown by the E in the diagram) to 4. 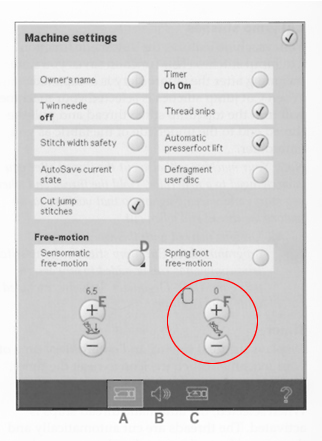 This adjustment has to be repeated when you power your machine up as the machine does not retain the adjustment like it does for the Embroidery Pressure Foot.